Supernatural elements in books are a fantastic tool to use with some plots. The two books I have chosen to review today use them quite well. First is a book by Eric Laster called #Static which is a Young Adult Mystery/Fantasy. The second book is by Daniel O'Malley called Stiletto, the sequel to the first in The Cheque Files after popular sci-fi/fantasy book, The Rook. Both books have a wonderful humor throughout that kept me turning pages to see what would happen next. If you like Jasper Fforde or Robert Rankin's books, you will definitely like these books as well. What would you do if you received a phone call from a recently deceased sibling? 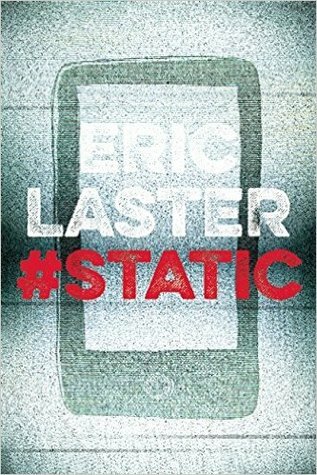 That is what happens to the main character, Curtis, in #Staticby Eric Laster. Curtis is sure his brother has called to help him solve Wilt's murder. His brother, Wilt, calls as part of the standard program of adjustment to the afterlife - an "inescapable, ever-expanding Walmart filled with discontinued products." This book is a murder mystery but includes some wonderful coming of age moments for Curtis. It also has some touching sibling moments between the brothers that make this a great read. Curtis goes on a daring plan to catch his brother's murder and along the way has to navigate the hormones of a teenage boy, handle a rocky home life, and avoid his school counselor. Will Wilt be successful in organizing a rebellion in the Aftermart? Will Curtis find Wilt's killer before someone finds him snooping around? All these questions help push this story from page to page. I would recommend this book to anyone high school age and up. Laster's humor along with his ability to weave in truly wonderful moments between the brothers and between Curtis and other supporting characters leave me wanting to read more from him. One of the things I appreciate about this book is the growth that happens to Curtis throughout the book. He is definitely a different person when the book ends. "Only one person has the fearsome powers—and the bureaucratic finesse—to get the job done. Facing her greatest challenge yet, Rook Myfanwy Thomas must broker a deal between two bitter adversaries. But as bizarre attacks sweep London, threatening to sabotage negotiations, old hatreds flare. Surrounded by spies, only the Rook and two women, who absolutely hate each other, can seek out the culprits before they trigger a devastating otherworldly war." This sequel has more wonderful female characters to love with wit and humor that Daniel O'Malley brought to us with Myfanwy Thomas in The Rook. Pawn Felicity Jane Clements and Grafter Surgeon Odette Lelifield are complete opposites and have grown up being taught to hate each other. Now with the merger of the Grafters and Chequey they have been thrust together during this major time of change for the secret organizations. Both have supernatural abilities that quite frankly disgust the other. They must come together to help keep the peace negotiations intact while managing to find out who is behind the attacks. O'Malley is brilliant as ever at creating strong, intelligent female characters. This sequel is a bit longer with larger chunks of exposition to give us readers enough to understand the motivations of the characters. Some readers may find this to be drier than The Rook, but it does its job. This helps push the readers into his world by giving us as quick a rundown of the secret warring groups. He uses this information to show just how far apart the divide between the two groups is at the beginning and how far they must come to keep the peace. There are main layers of subtext to read in this book and for me it hit home with a quote from the book on grief. In my life, while reading this, I was hit with the death of a young girl whose family I am very close with. This quote summed up how I was feeling then and still how I feel today. "It's been weeks now, and it doesn't stop I want it to go away!" "It won't ever go away entirely," said Felicity. "I wish it did. But with things like this, with wounds on the inside, sometimes it's just a case of getting through the day. Or the hour. Or the minute. Sometimes the hard times come every other minute, and they'll keep slapping you, so that you can't ever relax. And sometimes you'll go for weeks and maybe even months before it gets you, right when you least expect it. But it never goes away entirely." Odette sighed. "But it does get easier, Odette. And it's easier when you have comrades." You can picture the relationships that O'Malley creates from this conversation. Intelligent humans coming together to fight forces unknown. Change is hard for everyone because as a human we struggle to get our brains to think in different ways. It can be done but it's a precarious dance where every move needs to be thought out as though you are playing a long game of chess. Be forwarned with these books however that there were four years between publishings. 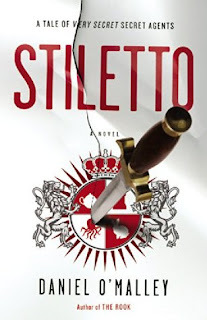 though we can hope that another book in this series will come quicker, if we must I would recommend filling the void with rereads and find the nuances the Daniel O'Malley hides in this book. Nice recommendations! I'll throw them on the ever-growing pile of things I want to check out.